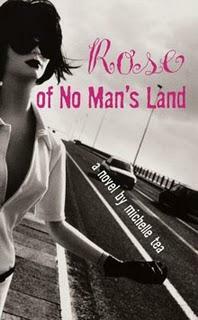 The author of four memoirs—one of which being a graphic novel that has been optioned for cable—a book of poetry, and collected essays, columns, you name it, Michelle Tea’s first work of fiction, Rose of No Man’s Land is an absolute treat. And this goes for those you who haven’t been following her work for the past decade, too. You might call it a contemporary bildungsroman for the young, queer, working class female consciousness, or you might not. Any way you slice it, Tea has written a hilarious, grotesque, sometimes sad, but overall captivating story about a fourteen-year-old girl name Trisha Driscoll and what happens when she meets a girl named Rose. Set in the here and now, Tea spares no detail of pop culture her highly accessorized audience could miss, which adds a great deal of color and vibrancy to the narrative. The setting, though, is the fictional town of Mogsfield, MA, just outside of Boston. Our mouthy and misanthropic protagonist Trisha takes us through what it’s like to have a couch potato/hypochondriac mom with an equally useless boyfriend, a sister whose ambition is to become a cast member on The Real World and friend like Rose who is wont to throwing used tampons at smarmy guys who sexually harass her. The novel’s plot culminates when Trisha and Rose have a long night of adventures resulting in Trisha’s first sexual experience and subsequent heartbreak, which Tea treats sensitively and without a contrived resolution. Though you might find yourself reading some parts quicker than others to get to the more action-packed sections (Trisha’s narration gets a little long-winded at times, but usually in a good way), Rose of No Man’s Land is smart and entertaining, which is not always easy to pull off. I checked this book out of the library after reading your review, and finished it in two days. I really enjoyed it and would recommend it to fans of unconventional coming-of-age stories. I love Michelle Tea! Great Review! I have not read this book but now I want to!